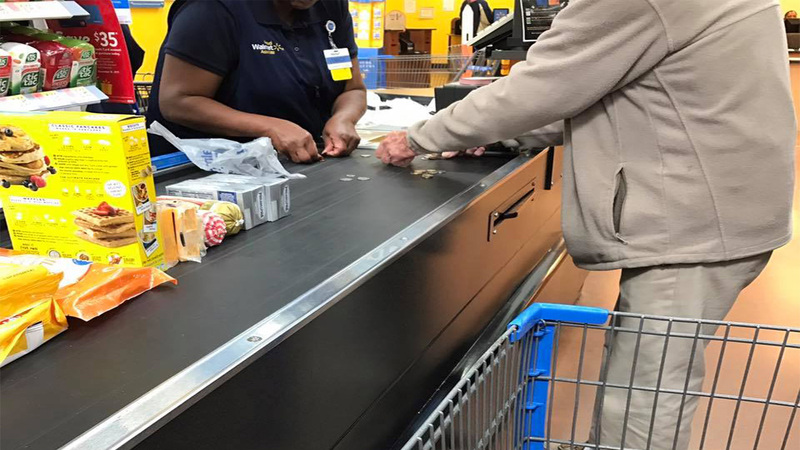 CLARKSDALE, Mississippi (WTVD) -- A sweet photo of a woman helping an older man count change is taking Facebook by storm. Mississippi resident Spring Bowlin was waiting in the checkout line at her local Walmart when she said her "heart was warmed." "This gentleman's items were scanned and he was given the total," she explained in a Facebook post. "He looks apologetically back at me and starts taking handfuls of change out of his pockets." Bowlin said the men then started to miscount and quickly became flustered. Embarrassed, he turned to her, voice and hands shaking, and said, "I'm so sorry." But Bowlin said the cashier wasn't fazed. "This beautiful cashier takes his hands and dumps all the change on the counter and says, 'This is not a problem, honey. We will do this together,'' the post continued. As the cashier helped him count every cent, the man continued to apologize. After the transaction was complete, Bowlin said she turned to the cashier and said,"Thank you for being so patient with him." "You shouldn't have to thank me, baby," the cashier replied. "What's wrong with our world is we've forgotten how to love one another." Bowlin said she was so touched by what she saw, she could only think one thing, "I want to be more like her." "Her humility when I thanked her was inspiring," Bowlin told ABC11. "It wasn't a big deal to her because that's obviously just who she is." As for the older gentleman, Bowlin said her heart went out to him. "I wanted to hug him," Bowlin explained. "I got out my card and was on the verge of stepping in to pay, but I stopped. I wasn't going to let him leave without his groceries if he came up short, but I didn't want to hurt his feelings. As the daughter, sister, wife, and mother of proud Southern men, I didn't want to wound his pride." Bowlin said the exchange made her feel hopeful, adding it's a lesson we all can learn from. "In a world where we are constantly told how bad things are, it gave me hope," she said. "(People) missed the blessing and honor of witnessing her kindness. Compassion like that has a way of changing hearts." According to the store manager, corporate has a "special recognition" planned for the cashier.